On the occasion of the educational programs and tours organized by the House of Parliament for Parliamentary and Democracy, 50 students from 35 European universities that study at AUEB through the Erasmus program, accompanied by the AUEB responsible for international mobility, Mrs. Elena Kanderaki, visited the Greek Parliament. The students were welcomed at the Senate Aula, by representatives of the President of the House, the members of the Parliament Mrs. Meropi Tzoufi, Professor at the School of Health Sciences of the University of Ioannina, and Mr. Kostas Douzinas, Professor at the Law School of the University of Birkbeck, London. 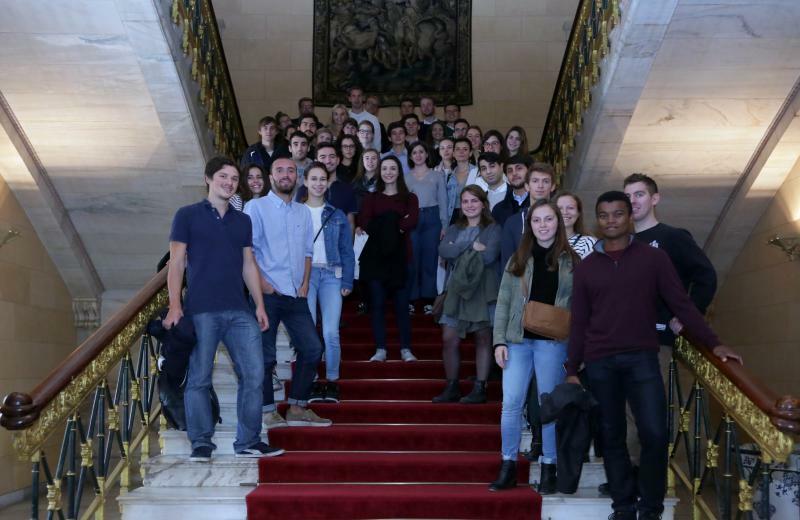 The students were given a tour to the Plenary Chamber, as well as to the exhibitions "Ioannis Kapodistrias, his Time in Time" and "Little Odyssey". During the tour, they were informed about the way the Greek Parliament operated, as well as about the history of its building.